Shamiaa Stewart first experiences homelessness in 2004, when she’s only nineteen. On the outside, she’s a legal adult. On the inside, she’s a child who has never known stability. The oldest of nine children born to drug-addicted parents, Stewart spends her first twelve or thirteen years with her family in a cramped apartment, the power often cut, the refrigerator usually empty. It’s a cold, claustrophobic struggle, until Child Protective Services pulls the kids out of the home. After a couple of placements don’t work out, fifteen-year-old Stewart, who battles severe clinical depression, is sent to live at a residential facility for children with mental health issues. She runs away more than once. She’s looking forward to her eighteenth birthday so she can leave the system and the system ad reunite with her mom, who’s gotten clean and left Stewart’s dad, who hasn’t. But just days after she turns eighteen, her mom dies suddenly of a brain aneurysm. And so Stewart, now finally of legal age but with nothing to her name but a last resort, moves in with her father in 2003. One year later, her dad is evicted. On and off for the next four years, Stewart becomes one of those “regular homeless”—until she finds a way out through a community effort called The Road Home. Until then, she’s in and out of homelessness as a single person, as a partner in a relationship and as a young mother-to-be. Stewart, and so many others like her, are among the homeless population you don’t hear much about, despite their majority: Each year in Dane County, about 3,500 people experience homelessness—nearly half of them children. In its 2014–15 annual tracking, the Madison Metropolitan School District alone identified 1,414 homeless kids in its schools. About ten years ago, United Way of Dane County—one of the largest funders of programs for ending homelessness for families, says Cranley—completely overhauled its approach to homelessness. The old model funded emergency shelter and safety net programs for its partners: YWCA Madison, The Road Home, Salvation Army and Porchlight. Today, United Way allocates the same amount—about $2 million a year—to the same partners, but those efforts are now focused on a decades-old concept called Housing First. Its proponents maintain that shelter is a basic human right, and that you shouldn’t have to first solve your problems—sober up, find a job, get a car and stabilize your mental health—before you “earn” the right to housing. 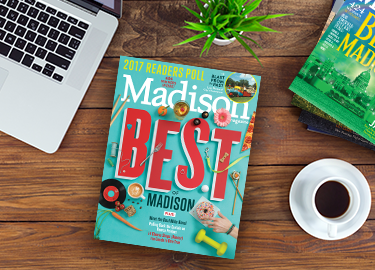 But a key barrier seems to be the very thing that Madison loves to celebrate about itself: It’s a really great place to live. At least for some people. Luxury and high-end development is historically high, while vacancy rates in recent years are historically low, hovering around two percent. (But it’s risen to 2.94 percent for the first three quarters of 2015, according to the Dane County executive’s office; mayor Paul Soglin says a balanced market would be at five percent.) At $53,933, Dane County’s median household income has not kept up with soaring housing costs—the average Dane County resident spends a staggering fifty-five percent of his or her income on housing. And even when at-risk renters have the money, it’s a landlord’s market. For people of color, this is compounded by the insidious, multigenerational impact of Madison’s gaping racial disparities. Nearly fifty-six percent of Dane County’s African American children are living in poverty. Many still can’t find a home at the end of the sixty- to ninety-day emergency shelter limits, even with the help of programs—and there are dozens of programs. For their part, the county and city are partnering to create more affordable, supportive housing, most notably sixty units on Rethke Road for chronically homeless men and women and forty-five units on Tree Lane for women and families. With his $2.75 million Affordable Housing Development Fund, Dane County executive Joe Parisi is awarding grants to private-sector and nonprofit developers who are working on this same goal, including Movin’ Out, Inc. for forty-eight units on West Broadway, Gorman & Company for seventy-six units at Union Corners, and Housing Initiatives, Inc., which partners with seventeen agencies to provide services. Housing Initiatives is an innovative twenty-year-old organization that works exclusively with homeless veterans and individuals with severe and persistent mental illness, ninety-five percent of whom are still off the streets. (Further, Madison Development Corporation announced plans in December for forty-six units on Mifflin Street. It’s downtown’s first low-cost housing project in ten years—and the nonprofit hopes to sell two other existing properties to Housing Initiatives.) But there’s more to the solution than affordable housing. “If people weren’t living in poverty, housing would be more affordable,” says Parisi, citing a low minimum wage, ongoing state cuts to public education from kindergarten through college and federal cuts to housing funds. What’s more, “There’s no one picture of homelessness.” Poverty, mental health issues, drug and alcohol addiction, family violence, people who can’t secure housing after incarceration—these groups may overlap, but all still have very different needs. Those needs also shift. For example, when Stewart first became homeless, she was a single woman; eventually, she became a mom in a family unit. Based on numbers alone, kids and families are at the center of most homelessness solutions, and United Way’s efforts are critical. It currently serves about a third of Dane County’s 445 homeless families, with an eighty percent success rate in keeping them settled in permanent housing—more than twice as successful as emergency shelter, at only half the cost. Nationally, the average cost per exit to permanent housing was significantly lower for rapid re-housing (about $4,100) than it was for shelter (about $10,000, according to the National Alliance to End Homelessness). Since its housing-first paradigm shift in 2006, United Way and its partners have effectively ended homelessness for nine hundred families in Dane County. United Way also partners with MMSD’s Transitional Education Program, or TEP, to identify and serve Madison’s 1,414 homeless kids. But solutions, funding and community buy-in are up, too, across the board. Moreover, stakeholders are getting on the same page in unprecedented ways. New this year, the Community Action Coalition began facilitating a coordinated entry system with a public hotline and a single, shared database of the county’s homeless, triaged by a new vulnerability index and accessible by all partner agencies. Plans for a city- and county-funded day resource center are slowly moving forward. The hope is that the center will relieve some of the pressure on downtown public common areas, provide a safe place for outreach between case workers and distrusting, vulnerable homeless and create a one-stop shop for all families who are unsure where to start or go next. It’s hard to pinpoint the worst part about experiencing homelessness. Most who end up homeless have already endured a lifetime of traumas, and homelessness in itself is a fresh, ongoing trauma. Forced to leave the night shelter by 8 a.m. and unable to return until 5 p.m., many pack all of their belongings and go off to jobs and school in the morning uncertain where they’ll be sleeping that night. Shelters—of which Madison has at least seven, each designed to serve a specific portion of the homeless population—are always full and they all, by law, have stay limits. Although it’s often a few steps forward and a couple of steps back, ideally shelter stays give homeless individuals and families just enough time to connect with programs and services that will give them a chance to get back on their feet. And then, at the age of twenty-one, she found out she was pregnant. At seven and a half months along, Stewart landed back at the Salvation Army shelter for single women. Once her daughter Valencia was born, the duo was in and out of the Salvation Army (upstairs in the family shelter and, later, the Warming House), the YWCA’s Third Street program (long-term housing with rent assistance), the living room couches and spare bedrooms of friends and, finally, The Road Home in 2008. The Road Home is the only agency in Dane County that works exclusively with homeless families with children. Its programming includes a day shelter, a night shelter in which more than fifty local faith congregations with 1,800 volunteers take turns housing families, and a handful of supportive housing solutions. One of them is 2014’s House of Hope, thirty units of affordable supportive housing that pairs each family with a master-level social worker in a building purchased and refurbished with a $4.5 million capital campaign; ninety-three percent of these families are maintaining housing for at least one year. Another is House-Ability, launched in 2008, a collaborative effort with the Salvation Army and YWCA to provide permanent rental subsidies and case management services for homeless families who have a parent with a disability. That year, due to her diagnosed mental illness, Stewart and her daughter became House-Ability’s second client. That’s Kristin Rucinski, who’s been with The Road Home for ten years and now serves as its executive director. About seven years ago, says Rucinski, The Road Home started making a push toward housing—a shift she largely credits United Way with catalyzing. Buying its own apartment building through the Housing and Hope campaign has proved critical in Madison’s notoriously tight housing market. Even more critically, case managers and social workers can go directly to their clients in their homes to provide key services, instead of having to track them down in shelter or temporary housing. Homeless service providers have described a rental market that includes racial discrimination, like a landlord asking inappropriate questions if an applicant’s name “sounds Black.” Or when a white case manager will call for an apartment and an eager landlord will schedule a showing, and then she “shows up with a family who’s Black and all of a sudden, that unit’s not available anymore. The YWCA’s Mueller, who, like Rucinski, is white, says “most” of her clients are people of color as well. Close to eighty-five percent of The Road Home’s clients—including Stewart—are people of color. Besides, Stewart, like many in her position, has a history that looks bad enough on paper to a potential landlord. She has an eviction nine years ago that’s still ruining her chances, and she has no idea how far into the future her past will reach. There are so many intersecting circumstances and inequalities at play in Dane County. As of the first of this year, a now thirty-year-old Stewart has voluntarily left The Road Home’s House-Ability program. That new assistance is Section 8 housing, which finally came through after years on the wait list; it caps her rent at thirty percent of her income. Finding a new place wasn’t easy: She endured twenty different rejected applications before opting to stick with her current landlord, where she’s moved into a larger unit. This is the most stable Stewart has ever felt. She’s got a good job in retail, where she was just promoted to shift supervisor; most of her coworkers don’t know she was ever homeless, and those who know can’t believe it. Her mental health management is relatively under control; she’s friendly and outgoing, and those days when it’s all so overwhelming she can’t even get out of bed are fewer and farther between. She’s got a vehicle she shares with her daughter’s father (although the windshield wipers don’t work). Most importantly, her daughter Valencia is a shy, sweet, bright and thriving third-grader—with no memory of ever being homeless. Although Valencia is not considered homeless, nearly two thousand of her classmates in Dane County are. About seventy percent of them are in the Madison school district, where TEP plays an invaluable role identifying, enrolling and educating those kids. TEP was established to carry out the McKinney Vento Homeless Assistance Act, a federal law that mandates that kids experiencing homelessness receive the same access to and benefits of a quality public education as their counterparts. But it’s hard to teach algebra and French revolutionary history to kids who might be starving, sleep-deprived, tooth-ached or experiencing a variety of symptoms when basic needs are unmet. All the while, Koester and her colleagues are simultaneously trying to protect the privacy of these kids so they don’t suffer further indignities due to the stigma of poverty and homelessness. And still, despite these unimaginable obstacles to education and extremely high-stress conditions, most kids excel within the program, to little or no fanfare. But all of these services essentially add up to a day program, and so many kids endure the stress of not knowing where they’ll be going after school, where they’ll be sleeping that night, how or when they’ll get their homework done, let alone have any kind of social life or participate in expensive extracurricular activities. That’s why that home base—housing first—is so foundational to any kind of permanent solution. It certainly was for Stewart. The life she has today, the life she’s able to give Valencia, once seemed utterly impossible—and would have been, she says, had she not received a chance for housing first and the critical supportive services The Road Home provided. But she has no desire to rely on programs for the rest of her life. Her goal is to keep building on this foundation, to go back to school to be an ultrasound technician just as soon as she can afford it. For now, work has to come first, just like it does for so many of the homeless she’s met along the way. They’re never far from her mind, those women who helped her in the beginning, and all the families she met in shelter in the years after, many of whom were working while homeless, just like her. Stewart gives back to The Road Home by helping set up for its events and speaking at its functions, despite her stage fright. In speaking out publicly about her own struggles, she hopes she can help others. Family Shelter offers short-term shelter, food, case management services to homeless families and may house 18 families for up to 90 days. The emergency community shelter for families with children is for one night only so families need to call for intake each day. Serves homeless families with children for up to 90 days through collaboration with local religious congregations and helps families transition into permanent housing. An emergency shelter for 10 to 12 homeless families each night depending on family size. Families must be referred by The Salvation Army. A 24-hour shelter for the mentally ill that provides beds for 14 men and women at a time and offers meals and services to 20 to 25 people on a drop-in basis during the day. Community Action Coalition for South Central Wisconsin Inc.
A toll-free hotline number that provides coordinated intake services to homeless persons and those at risk of becoming homeless. Drop-in temporary overnight emergency shelter offering two hot meals (breakfast and dinner) per day, personal grooming supplies, showers, laundry facilities, and outreach services for up to 135 single men. This toll-free hotline number provides coordinated intake services to homeless persons and those at risk of becoming homeless. Drop-in emergency shelter and supportive services for up to 30 women experiencing homelessness at a time. DAIS offers temporary, emergency shelter for victims of domestic abuse and their children. Support resources for children and adults include housing advocacy, information and referrals, support groups, and time and space to heal. The day center provides homeless and at-risk individuals with information and referral services, unlimited computer use, a biweekly clothing/hygiene pantry, bathrooms, telephone access, food/beverages, resume advice, employment and housing search assistance, ID card/birth certificate/Social Security card recovery, limited financial assistance, and various other services all in an encouraging social setting. Hospitality House is a daytime resource center offering services to homeless and low-income men, women and families. The toll-free hotline number provides coordinated intake services to homeless persons and those at risk of becoming homeless. Provides shelter, assessment, counseling, case management, food, clothing as needed, and assistance with finding safe and stable housing for youth in the area. Youth can stay in the shelter 1-28 days depending on the situation. Serves runaways, homeless, and throwaway youth and their families, street outreach and youth groups. Host Home volunteers provide temporary emergency shelter for teens who need relief from their homes, or for runaway or homeless youth who immediately need a place to stay. The Shelter Home offers unlocked residential services for juveniles who may need a place to stay awaiting further court action but for whom placement in a secure setting (detention) is not necessary or legal. Provides case management and subsidized housing to formerly homeless or at-risk youth ages 18 to 22 using the cooperative housing model and provides participants with life-skills training, job readiness assistance, and education goal support. Project RESPECT is a women’s center that delivers advocacy, case management, counseling, crisis intervention, transitional housing and peer support group services for women with prostitution histories that have changed or want to change their lives. The 9-bed, 24-hour staffed community based residential facility (CBRF) or group home for women that is a supportive structured living experience and assists individuals in achieving their greatest capacity for independent living. Hope House offers families with case management support, including assistance with employment, education, parenting skills and child care as needed. The Veterans Assistance Program helps homeless veterans and those at risk of becoming homeless receive the job training, education, counseling and rehabilitative services (alcohol and drug abuse treatment) needed to obtain steady employment, affordable housing and the skills to sustain a productive lifestyle.? Provides transitional housing, job training, counseling, health care, legal assistance, benefits and entitlements information, treatment for alcohol or drug abuse problems, and education for veterans who are homeless or at risk of becoming homeless. Transitional housing for Veterans who are homeless or at risk of homelessness. Provides a sheltered apartment living experience to help individuals in re-entering independent community living. Permanent supportive housing is for individuals and families that are literally homeless (HUD's definition of living on the street or in shelter or fleeing domestic violence) with a documented disability. Permanent supportive housing is for individuals and families that are literally homeless (HUD's definition of living on the street, in shelter, or fleeing domestic violence) with a documented disability. Housing is provided in scattered-site apartments in Dane County that are leased by CAC. What makes Wisconsin cheddar cheese orange?